Telekom Malaysia Berhad (TM) announced its Third Quarter (3Q18) financial results on Monday. 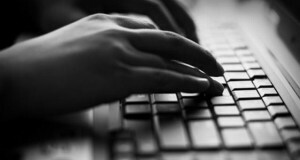 The fixed line and Internet Service Provider (ISP) now has 2.29 million fixed broadband subscribers as of September 2018, down from 2.3 million it had in 2Q18. There are now 1.26 million Unifi subscribers. 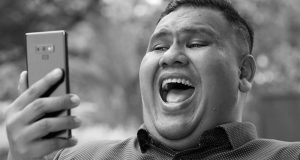 Telekom Malaysia added 44k new subscriptions to the base, from 1.22 million it had in 2Q18. However, its Streamyx subscriber base is down by 60k customers, now at 1.03 million (vs 1.09 million in 2Q18). 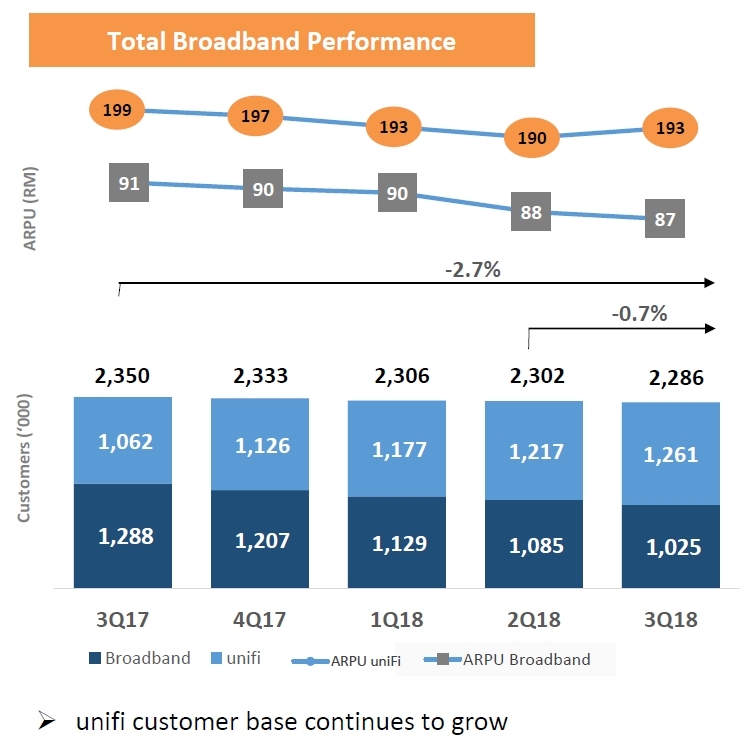 ARPU for Unifi increased to RM193 in the latest quarter (vs RM190 in 2Q18) while Streamyx ARPU dropped to RM87 from RM88 in the previous quarter. Telekom Malaysia Berhad (TM) today announced its financial results for the quarter ended 30 September 2018. The Group saw steady operational performance, amidst heightened challenges in its operating environment, namely industry and market challenges impacting its revenue. The Group held revenue steady, at RM2.95 billion in 3Q2018, 0.3% higher from RM2.94 billion in the previous quarter, on the back of higher data as well as other telecommunication related services revenue. Group Reported Earnings Before Interest, Tax, Depreciation and Amortisation (EBITDA) for 3Q2018 grew 11.3% to RM941.4 million as compared to RM845.9 million in 2Q2018 mainly due to lower operating costs. Group Normalised EBITDA, which excludes non-operational items, increased 13.1%, at RM930.9 million. However, due to impairment loss on wireless and fixed network assets, the Group recorded Loss Before Interest and Tax (LBIT) at RM631.8 million for 3Q2018. Without the reported impairment and other non-operational items, the Group’s Normalised Earnings Before Interest and Tax (EBIT) is at RM315.6 million for 3Q2018, a 39.4% increase against Normalised EBIT of RM226.4 million in 2Q2018. Consequently, the Group reported Loss After Tax and Non-controlling Interests (LATAMI) of RM175.6 million compared with RM102.0 million Profit After Tax and Non-controlling Interests (PATAMI) in the prior quarter. TM’s core net profit, or Normalised PATAMI excluding non-operational items, stood at RM266.4 million, a 71.0% improvement sequentially. The total capital expenditure (CAPEX) investment for the first nine months of 2018 at RM1.32 billion, or 15.1% of revenue. This is within TM’s full year capex guidance of 19-20% of revenue. By asset type, access comprised 62% of total spending, followed by core network at 15% and the remaining 23% was for support systems. Imri Mokhtar, Acting Group Chief Executive Officer, TM said: “We continue to face various headwinds from competitive market dynamics. Nonetheless, we held revenue steady over the quarter, and saw our cost reduction initiatives bearing fruit, by recording improved operational performance for QoQ and YoY. “The operational improvement in 3Q2018 is testament to the Group’s commitment to the four (4) pillars of our Performance Improvement Programme (PIP 2018) – Revenue Uplift / Preservation, Sustained Profitability, Improved Cash Flow and Increased Productivity that will navigate us through these headwinds. We are rationalising our business, reducing operating costs and focusing our resources on the opportunities that will have the most impact,” Imri elaborated. “We currently have 2.29 million broadband customers and our unifi customer base continues to grow at 1.26 million as at end of 3Q2018 as compared to 1.06 million as at the end of the corresponding quarter last year. 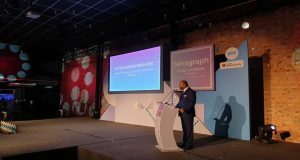 In terms of convergence, we saw more customers moving up the value chain with having triple-play services and above, evidenced by our convergence penetration now at 48% of TM’s household penetration compared with 39% this time last year,” he added. TM also announced a revised dividend policy which states that the Company intends to distribute yearly dividends of 40 to 60% from its PATAMI. Dividends will be paid depending on overall business and earnings performance, capital commitments, financial conditions, distributable reserves and other relevant factors. The dividend policy will take effect from the next dividend declaration. 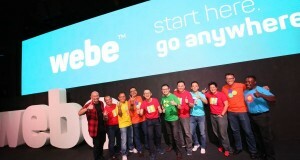 As Malaysia’s Convergence Champion, TM remains committed to fulfilling Malaysians’ digital and communication needs of all customer segments i.e., consumer, SME, corporate enterprises, public sectors, access seekers etc via our business clusters, unifi (consumer & SME), TM ONE (Enterprise and Public sectors) and TM Global (Global and Wholesale). The recent industry challenges and market environment have had major impact to the overall revenue estimates and earnings of TM Group in the financial year. TM anticipates that the challenging environment will persist for both its retail and wholesale segments. In the midst of these challenges, TM will continue to focus towards strengthening performance of its core business and operations.